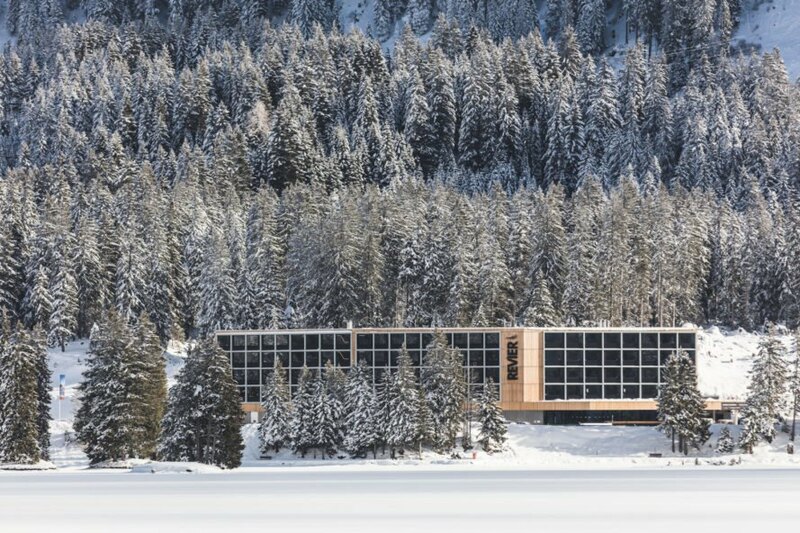 This minimalist and modular hotel in the mountain resort of Lenzerheide, Switzerland offers a streamlined and modern take on the traditional mountain chalet. Carlos Martinez Architekten‘s Hotel Revier is composed of prefabricated rooms lined in natural, unfinished plywood with glazed end walls. 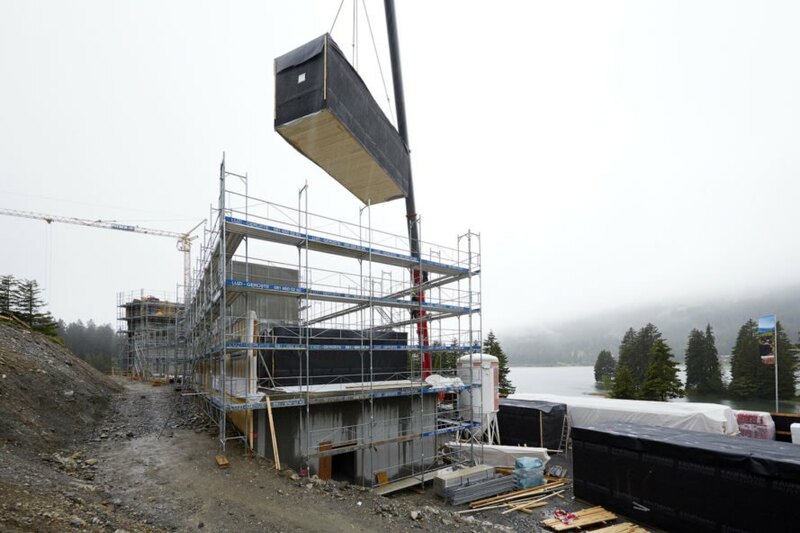 The long and narrow larch-clad building comprises three rectangular segments angled to follow the shoreline of the Heidsee and positioned to face panoramic mountain views. The hotel’s communal core, made up of the lobby, bar, and restaurant, occupies the ground floor, while the four floors with a total of 96 rooms are stacked above. The 160-square-foot standard rooms, prefabricated and fully equipped offsite, were assembled into a metal framework. Each standard room includes a wall-to-wall bed that can be folded up into a sofa, TV, floor-to-ceiling window, hooks, narrow ventilation wings, a deep windowsill, and a heating unit for drying gloves and clothing. Hotel Revier also includes four barrier-free and 29 triple-bed rooms, also prefabricated. By stacking the modules side by side, the architects create a “double-wall” effect with the advantage of improved acoustic insulation. 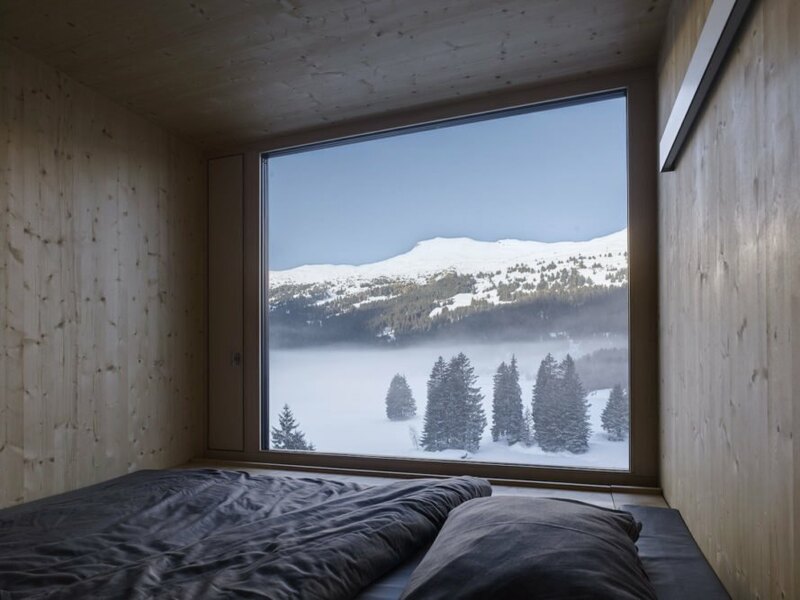 This minimalist and modular hotel in the mountain resort of Lenzerheide, Switzerland offers a streamlined and modern take on the traditional mountain chalet. 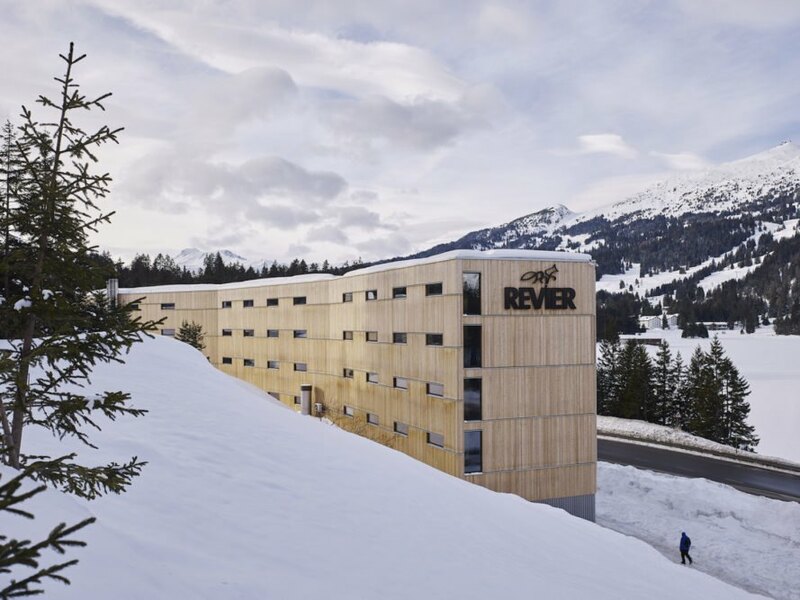 Carlos Martinez Architekten designed Hotel Revier with prefabricated room modules, each with a glazed end wall and lined in natural, unfinished plywood. The long and narrow larch-clad building comprises three rectangular segments angled to follow the shoreline of the Heidsee and positioned to face panoramic mountain views. 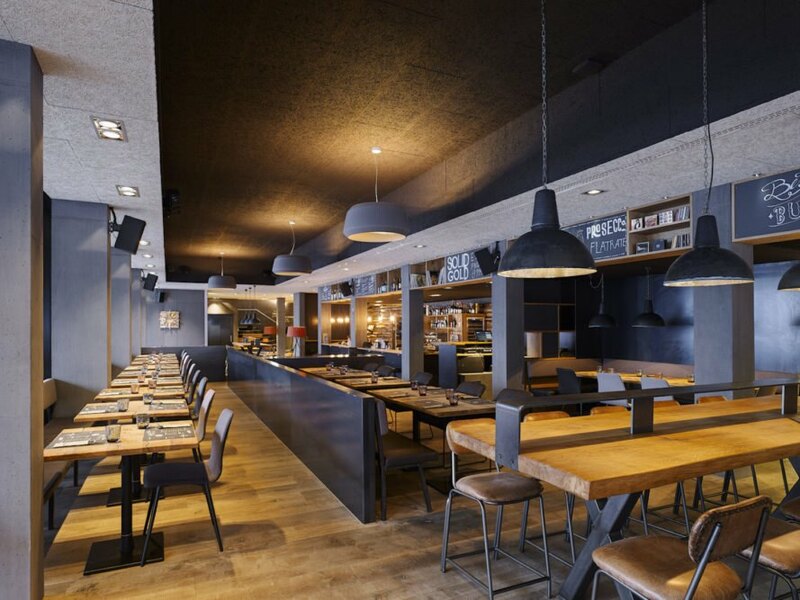 An exercise in minimalism, the sports-oriented Hotel Revier is “reduced to the bare essentials,” wrote Carlos Martinez Architekten. The hotel’s communal core, made up of the lobby, bar, and restaurant, occupies the ground floor, while the four floors with a total of 96 rooms are stacked above. Each standard room includes a wall-to-wall bed that can be folded up into a sofa, TV, floor-to-ceiling window, hooks, narrow ventilation wings, a deep windowsill, and a heating unit for drying gloves and clothing. By stacking the modules side by side, the architects create a “double-wall” effect with the advantage of improved acoustic insulation. Hotel Revier also includes four barrier-free and 29 triple-bed rooms, also prefabricated. 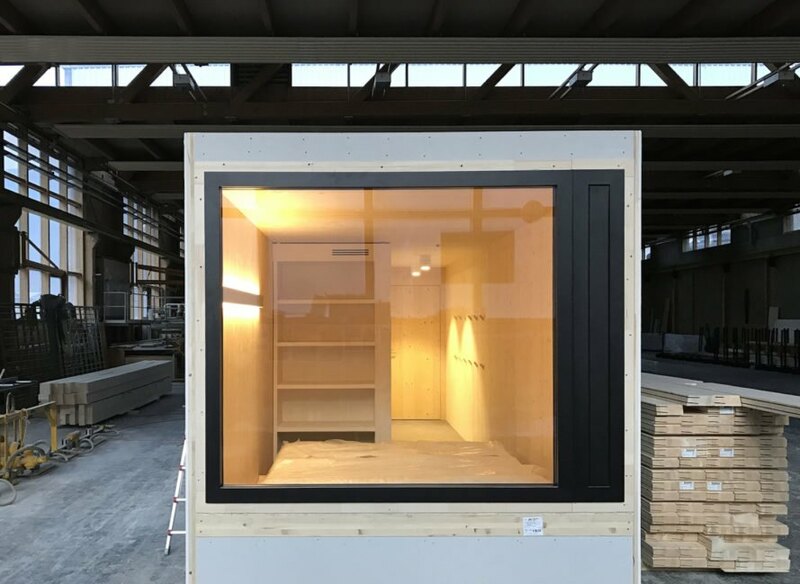 The 160-square-foot standard rooms, prefabricated and fully equipped offsite, were assembled into a metal framework. 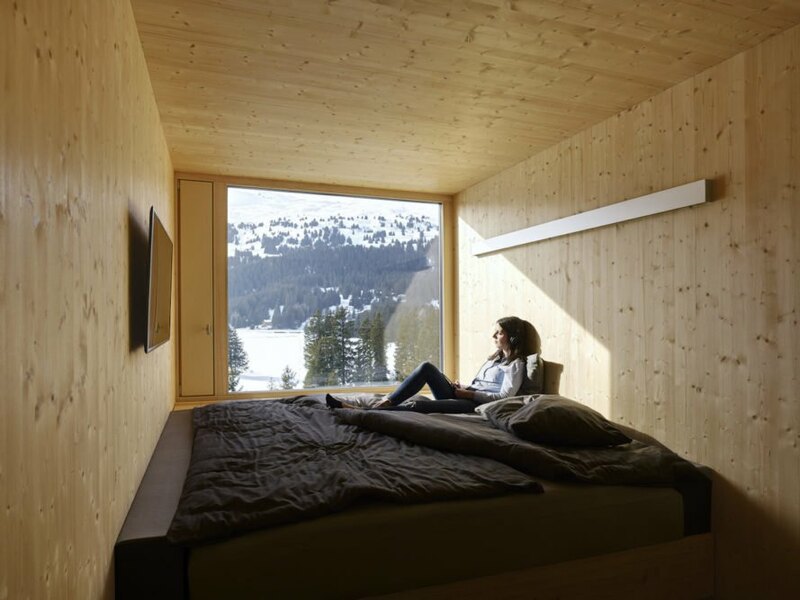 This minimalist and modular hotel in the mountain resort of Lenzerheide, Switzerland offers a streamlined and modern take on the traditional mountain chalet. Carlos Martinez Architekten's Hotel Revier is composed of prefabricated rooms lined in natural, unfinished plywood with glazed end walls. The long and narrow larch-clad building comprises three rectangular segments angled to follow the shoreline of the Heidsee and positioned to face panoramic mountain views.